Welcome to the web home of THE EAGLE SOCIETY. THE EAGLE SOCIETY is dedicated to the memory of EAGLE - Britain's National Picture Strip Weekly - the leading Boy's magazine of the 1950s and 1960s. We publish an A4, quarterly journal - the Eagle Times. This weblog has been created to provide an additional, more immediate, forum for news and commentary about the society and EAGLE-related issues. Want to know more? See First Post and Eagle - How it began. Keith Watson (1935 – 1994) was born in Ormesbury, Middlesborough. In 1950, at the age of fifteen, he was inspired by seeing Frank Hampson’s ‘Dan Dare’ in Eagle and he became an instant fan. Although he had received no formal art training, in 1957 or early 1958 he submitted what was to be a successful job application to Frank Hampson, a pastiche front page of Eagle showing, in strip form, Dan & Co.’s reaction to the arrival a new artist – himself. Although there was no vacancy, Hampson was suitably impressed, and in 1958 Keith joined the ‘Dan Dare’ studio team as an assistant artist. After Hampson left in 1959, and Frank Bellamy took over as lead artist on ‘Dan Dare’, Keith continued along with the remainder of Hampson’s team but, dissatisfied at the way of working, he too left in 1960 - to draw ‘Captain Condor’ in Lion. Two years later, he returned to Eagle as the sole artist on ‘Dan Dare’, and continued until early 1967 when Eagle began reprinting old ‘Dan Dare’ strips. After Eagle, Keith drew strips for a number of comics: ‘Sky Shark’ in Topper, ‘The Space Girls’ in Tina and Princess Tina. In 1968 he drew ‘Captain Scarlet and the Mysterons’ in TV21, and the next year, the title strip in Joe 90. In the late 1970s, he took over the ‘Roel Dijkstra’ football strip for a Dutch publisher. In 1989, he revived the “original” ‘Dan Dare’ for Fleetway's “new” Eagle, after which, in the early 1990s, he drew for Thunderbirds: the Comic. His final work, commissioned by Eagle Society member Rod Barzilay, was for a new “old school” ‘Dan Dare’ strip. After producing some designs and the first page, Keith was diagnosed with cancer. 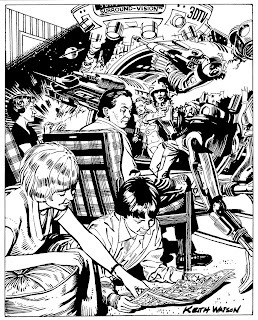 The opening page of ‘The Phoenix Mission’ (which appeared, posthumously, in the first issue of Spaceship Away in 2003) was to be the last he drew. The illustration is a self portrait of Keith sent in by Richard Sheaf, who informs us it is from Strips '80, the handook of the Society of Strip Illustration. It is part of a directory of SSI members and was intended as an introduction for those who attended the SSI conference in November, 1980. Membership of THE EAGLE SOCIETY is via Annual Subscription to EAGLE TIMES magazine, which is published four times annually. Please make cheques payable to the 'Eagle Society'.